Work can be fun. But until now there has been no systematic way to make it so. We analysed people’s motivation and built a taxonomy of 21 types of fun. It’s a new way to describe why people enjoy things they're not paid for, so fun can be designed into work. As simple tasks are mechanised and work becomes more complex, we are relying more and more on intrinsic motivation. Pay is not enough - people will achieve far more at far lower cost if the work itself is fun. The problem is, we don't have the tools and the language to redesign any kind of work and make it more energising. All we have, at present, are some isolated case studies and examples. Most of those rely on competition as the central motivator. That's fine for competitive people (such as the male-dominated world of computer programming) but what about everyone else? How do we redesign work activities for people whose satisfaction comes from aesethetics, sociability or storytelling? Or how do we turn office drudgery into physical activity for the active, and into cafe conversations for the sociable? To achieve this we need way to discover the many different kinds of satisfaction that matter most to people - the things that give them a buzz, a truly intrinsic reward - so that individuals, teams and organisations can re-design their work and take the 'work' out. Here is the proposed (and already piloted) process to make work more fun. This process can be used at individual or team level in organisations. Fun profiling could also be used to match people to work they are likely to enjoy. 1. Analyse your motivation by thinking about fun non-work activities and ask: What energises me? 3. Now analyse your work, or a particular item of work, using the same framework. 4. Based on the difference, it becomes obvious why the work is not as fun as it could be for everyone. 5. Re-design your work to incorporate activities that you and your team find more energising and fun. To do this systematically requires a taxonomy of fun - a set of core concepts that describe all the different ways that an activity can be immediately satisfying and energising. So that's where we (at R&D think-tank Ci) made a start, in partnership with AIESEC the world's largest student-led organisation. We asked students and young workers around the world to tell us what they do for fun (at leisure, outside work). 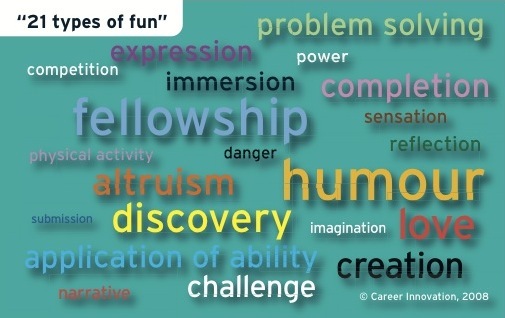 Then, using 21 types of fun that we developed from models in the computer gaming industry, we asked them what kinds of satisfaction/fun they gain from those unpaid activities. For comparison, we asked workers about the satisfaction they gain from paid work. The result of our initial global research is a set of questions people can use to profile themselves and identify their 'fun profile', comparing their experiences and profile with other people around the world. This approach can also be used by individuals and teams to redesign their work, increasing productivity and enabling new forms of matching and (self-)selection for work tasks. Before we embarked on developing the 'fun profiling' idea, we took an early taxonomy of fun and gave it to a team leader in a well-known telecommunications company in the UK. He was keen to try it with his team. The team leader proposed a simple process for his team to improve their team meetings, which they all agreed needed to be more engaging. Using paper only (no online tools at this stage) they all rated their fun profiles, talking about the kind of activities they enjoy outside work. (By the way this was a great team-building conversation itself). Then they set about redesigning their team meetings to include some of the components that would make it more energising - simple things such as more dynamic voting processes for decision-making as a group. This initial success prompted us to develop a more robust taxonomy of fun, so we can profile many different types of people and their diverse leisure and work activities. We are keen to collaborate in joint venture with an entrepreneur or investor, a training company and software developer and potentially a university to test, refine, fund and deploy this approach more widely with organisations and with the public. With thanks to: Charles Jackson, Paul Townsend, Peter Kumik, Jill Pryse-Davies, Linda Shelley, Lindsey Fallow, Jack Fallow, Jonathan Hyde, Jim Pilarski, Dorota Kowalska, Chris Dunn, Steven Fretwell, Stephane Le Camus, Andrew Marritt, Lucy Symons and all our friends at AIESEC. It was very heartening to see this article. The only way of most effectively carrying out any work is by making it a fun. A great spiritual teacher once remarked that, "if a child were to be given a responsibility to play with a cat, it wouldnt be fun. he plays with it daily because it is fun." So too with us, whether it is at work place or our own life, to be happy we should be able to make our work a play or fun. Hope more managements and people realize this. Thanks Ivaturi. I think there is so much potential to redesign work in this way, and I'm grateful for your comment. There will, I'm sure, always be aspects of work that are dull (and indeed, it can be a spiritual discipline to be content and see the value that lies in many mundane tasks) but there is huge scope to bring creativity and life into work. I hope that the work we have done to develop a 'taxonomy' will stimulate some new ideas and practices here.